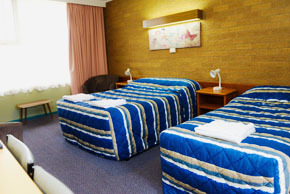 Your hosts Peter, Tina Moody strive to offer 14 modest, clean & comfortable rooms in a serene environment at a reasonable price. 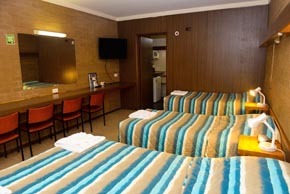 Queen Twin - consists of a queen bed, and single bed, non smoking, separate bathroom, Lcd Tv, free wifi, dvd players and dvd titles available foc available on request, airconditioning in all rooms, tea & coffee making facilities, microwave. Queen Standard - consists of a queen bed, non smoking, separate bathroom, Lcd Tv, free wifi, dvd players and dvd titles available foc available on request, airconditioning in all rooms, tea & coffee making facilities, microwave. 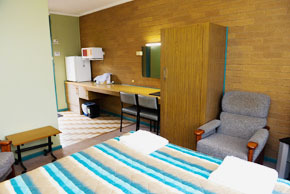 Deluxe Double Twin - consists of a Double bed, Single bed, and couch, non smoking, separate bathroom, Lcd Tv, free wifi, dvd players and dvd titles available foc available on request, airconditioning in all rooms, tea & coffee making facilities, microwave. 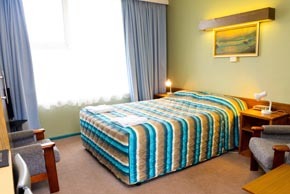 Standard Double Twin - consists of a Double bed, and single bed, non smoking, separate bathroom, Lcd Tv, free wifi, dvd players and dvd titles available foc available on request, airconditioning in all rooms, tea & coffee making facilities, microwave. Double Standard - consists of a Double bed, non smoking, separate bathroom, Lcd Tv, free wifi, dvd players and dvd titles available foc available on request, airconditioning in all rooms, tea & coffee making facilities, microwave. 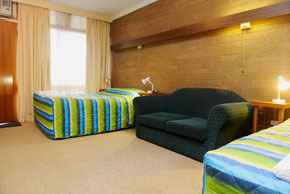 Family Room - consists of a Double bed, and 2 single beds, non smoking, separate bathroom, Lcd Tv, free wifi, dvd players and dvd titles available foc available on request, airconditioning in all rooms, tea & coffee making facilities, microwave.